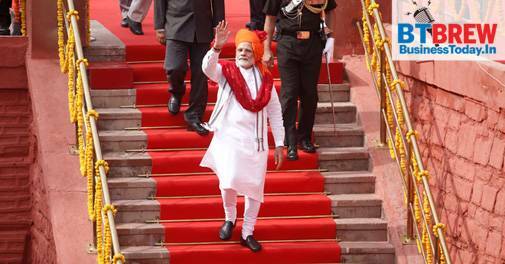 Prime minister Narendra Modi delivered his fifth Independence Day Speech as PM. Running parallel to the Ayushman Bharat-National Health Protection Scheme would be the Jan Aarogya Abhiyan which would kick off on September 25, he announced. The healthcare schemes will ensure access to good quality healthcare for the poor and marginalised. Modi also said India used to be a 'sleeping elephant', but has started walking and running now'. He announced a manned mission to space by 2022. He also thanked the business community for the success of GST. The rupee fell to a record low of 70 against the dollar on Tuesday amid fears that the financial troubles faced by Turkey may spread to other emerging economies. The rupee ended trading on Tuesday at 69.89 per dollar.Attributing the fall in rupee value against the US dollar to 'external factors', economic affairs secretary Subhash Chandra Garg said that there was nothing to worry about as long as the depreciation was in line with other currencies. With rupee touching a fresh all-time low of 70.08 against dollar , Congress President Rahul Gandhi turned the heat on the Narendra Modi government over its failure to control the declining rupee. The Indian currency has seen nearly 10 per cent fall this year alone. Taking a jibe at Prime Minister's remarks of "70-year misrule" of various parties, including the Congress, the party said "Modiji finally managed to do something that we couldn't do in 70 years". Days after private lender Kotak Mahindra Bank said it had used the preference share allotment route to reduce promoter Uday Kotak's shareholding in the bank, the RBI rejected it saying "it does not meet their promoter holding dilution requirement". In a regulatory filing on Tuesday, Kotak Mahindra Bank said it still believes that the bank's stake dilution plan meets the requirement, and assured to continue engaging with the central bank over the issue. A survey, prepared by Kotak Wealth-Hurun, features Smitha Crishna, the third generation heir of the Godrej empire, as the wealthiest Indian woman with net worth of Rs 37,570 crore. The total wealth of each woman featured in the top 100 women exceeds Rs 1,000 crore, while their average income is around Rs 4,000 crore. Kiran Mazumdar-Shaw is the only richest self-made women -- with the total wealth of Rs 24,790 crore - who could make it to the top 100. Following Smitha is HCL CEO and Executive Director Roshni Nadar, whose net worth is around Rs 30,200 crore. On the third spot is Indu Jain of Bennett Coleman and Co Group, whose total wealth is estimated to be around Rs 26,240 crore. Micro-blogging platform Twitter has launched Twitter Lite Android app in 21 more countries, including India, that will minimize data usage. It will load quickly on slower networks and take up less space on a mobile device. It's on the same lines as Facebook Lite and Youtube Go. The app, built for 2G and 3G networks which are still in use in several parts of India, helps a user save on data while using it. Registrations for Jio GigaFiber high-speed broadband are now officially open, allowing you to show your interest in the service. Jio GigaFiber was announced last month at the company's 41st Annual General Meeting, and will provide speeds to 1Gbps, according to the company. The company will give priority to areas with the highest interest for the rollout. The Jio broadband service was being tested out for the past two years. Cash-strapped Indian hospital operator Fortis Healthcare Ltd said it was starting to see some signs of recovery, as it secured shareholder approval for its takeover by Malaysia's IHH Healthcare Bhd. Fortis which operates 30 private hospitals in India has been struggling with a cash crunch, rising debt and other problems. IHH will invest 40 billion rupees at 170 rupees per share in Fortis.